When it comes to dorm neighbors, some things are better left unknown. Notes: This is delightfully crispy when it’s freshly made, but it unfortunately doesn’t stay that way for more than a few hours. Fortunately, it is entirely possible to consume the entire batch in one short sitting. I have tried many times, and also succeeded many times without trying. 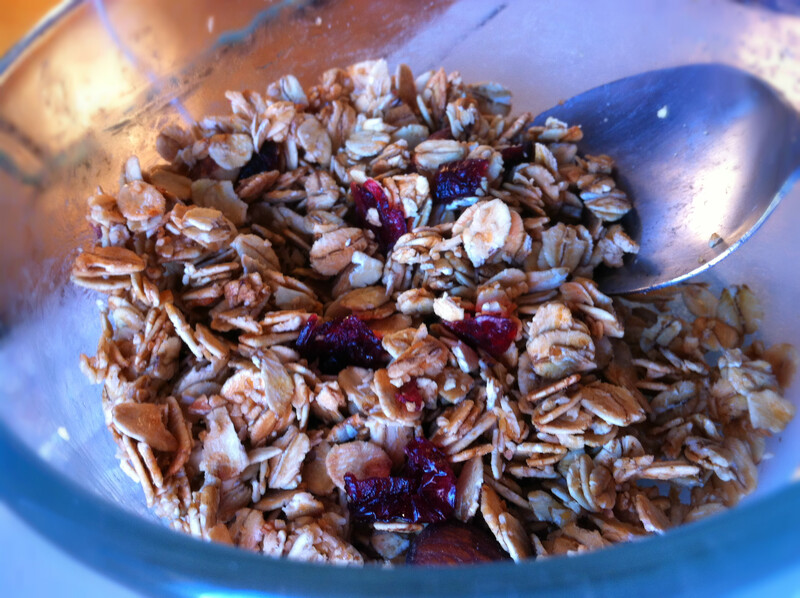 Also, I’ve left out the quantities of each ingredient—because granola should be spontaneous, fun, and wild. old-fashioned oats. Your mom and other recipe sources have told you many times but I’m going to say it again: not the quick oats. honey. Or agave nectar, or anything sticky sweet. nuts. If you haven’t eaten all of them during your midnight snacking rampages. Put everything in a bowl and mash together until there’s a thin layer of honey coating everything. 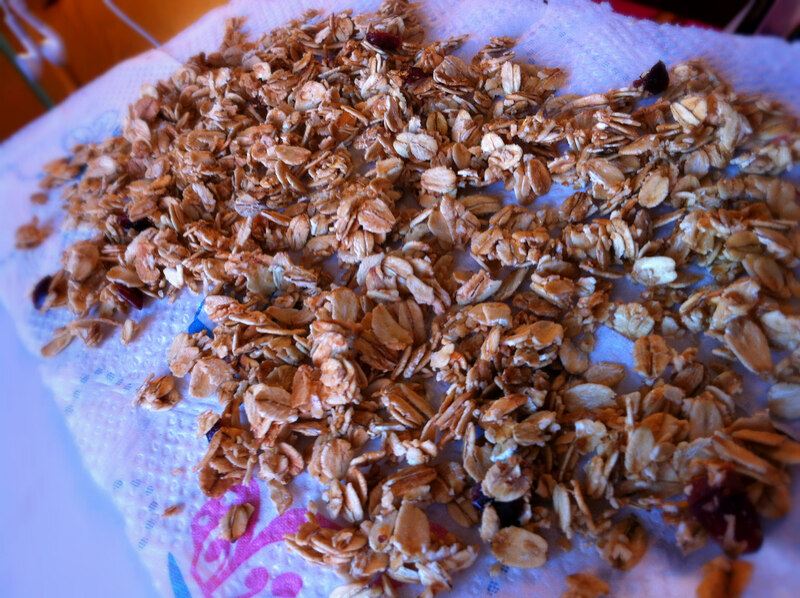 Now pop it in the microwave and heat for one minute, or until the oats are a nice sizzling golden brown. Stir occasionally and keep your eye on it! Take it out, lay it flat, and let it cool. As it cools, it gets crunchy. As it gets crunchy, you get happy. Sunbathing; it’s rude to stare. Add some cocoa powder or shredded coconut or whatever you have on hand that happens to be in small bits. Add real chocolate. Watch it melt into delicious ribbons. Now: Imagine this on a soft pillowy bed of strawberry yogurt. Imagine this drowned in milk. 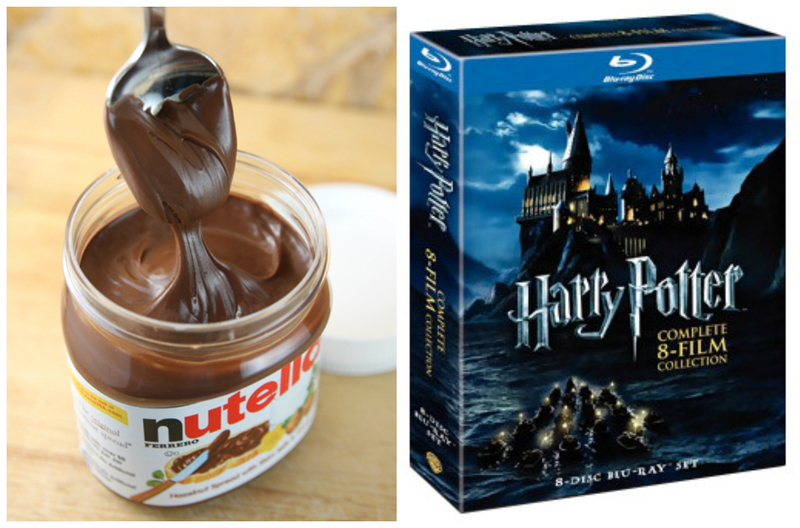 Imagine this immersed in dreamy Nutella. I think my salivary glands are misfiring. I can’t wait to try this. This will be a great quick on the go snack love it!!!! I love my fresh made oven granola. I wonder why this won’t stay crunchy though. Boo 😦 It would save me so much time! Yeah, I have the same problem with cookies… Have you tried keeping it airtight? When I make it in the oven, I store it in the fridge in a ziplock. It stays plenty crunchy. But it has to cook for an hour and be flipped/stirred every 10 minutes. 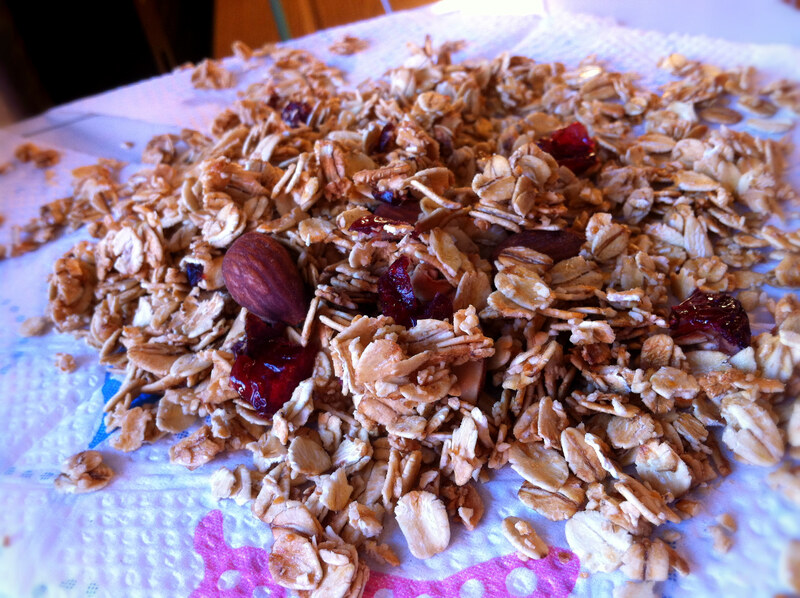 Yeah, it’s hard to make granola stay crunchy. Although I must say you have quite the patience to let it bake for an hour. Have you found that an hour of baking is better than, say, 25 minutes? Simple indeed! I hope you try this and enjoy it! This looks perfect! I’ve got to try this! I love granola, but have a hard time finding a good one for me because I’m allergic to soy and most granolas have soy products in it. Thanks! You’re welcome! I hope you enjoy it! And thank you for the award–I’m so glad you’re enjoying my writing!! Wait. Wait wait wait. Granola…in the microwave? This is a thing? How did I not know this was a thing? ?